Eager to take charge of their health data, engaged patients are reshaping the ROI landscape. As I spent time touring the AHIMA convention floor in September, I wondered how the release of information (ROI) vendors felt about their industry changing in light of the rapid transformation to electronic health information systems. I then reflected on my own journey managing this function across the integrated delivery system for the past 31 years, arriving at a state where engaging consumers was paramount to success. The ultimate destination will enable consumers and/or their proxy to access and manage their health information, while ensuring physicians and providers safeguard the privacy, integrity, availability, and quality of the clinical information. In the legacy paper medical record world, ROI used to be a rather straightforward but labor-intensive function. A hospital would employ staff to process ROI requests involving “face-to-face” interaction with many key customers: patients or family members, insurance companies, attorneys or process servers, law enforcement, physicians, and researchers. There also would be phone requests, most of which involved physician offices and insurance offices. Finally, there were internal requests to fulfill many of the aforementioned customer requests from patient financial services, quality management, admissions, and researchers. The requestor would need to be authenticated and asked by the ROI clerk to produce an authorization or, in the case of a direct caregiver, demonstrate a relationship with the facility. The turnaround time to process an ROI request typically ranged from two weeks to 30 days. Following review of the authorization (which in later years had to comply with HIPAA privacy requirements and/or state law if it was more stringent), the ROI clerk would create a pull list or directly pull the records from a file. Then the fun started: Sometimes volumes of records would need to be copied to meet all the requests. After the records were pulled, copied, and readied for shipment, payment based on the billing status of the request needed to be determined. If the threshold was met, the requestor was billed according to state law harmonized with the HIPAA privacy requirement, which sides with state law if the requirement benefits the patient. The record was mailed to the requestor by either the ROI clerk or the ROI vendor. Throughout my career as an HIM director, ROI vendors remained key components in the process despite the advent of electronic systems, patient and payer portals, and health information exchange (HIE) solutions. It still made financial sense to retain the ROI vendor to deal with residual paper releases. Although many colleagues “insourced” this function after implementing a fully electronic system, the return may not always prove to be profitable. When I reflect on my own transition to a paperless medical record in 2002 and a fully electronic record in 2009, it seems we were all a bit naïve regarding how an electronic environment would simplify ROI. We were of the opinion that time, materials, and personnel would be radically reengineered through the electronic record transformation. We quickly discovered that paper was not often replaced, as many requestors demanded pulp over electronic review. A CD option that frequently was unsupported by the vendor took countless hours, ingenuity, and technical savvy to figure out. Although we upgraded applications to deal with ROI, various versions across vendor platforms were poorly designed, with dictionaries thrown in as an afterthought. 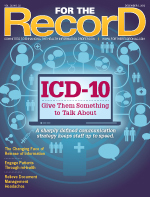 Many HIM directors in large and small hospitals found the task of consolidating a record request overwhelming. For example, extensive record requests involved retrieving, selecting, printing, and combining portions of the paper, legacy electronic, and fully electronic systems. Productivity standards had to be adjusted in the wrong direction; printing and paper costs increased because flow sheets and other portions of the EMR were designed only for viewing and not for printing. In one instance where the hospital was not allowed to burn a CD, the fulfillment of the request involved filling an entire conference room with copies of the medical record. In the early days of EHR conversion, many HIM directors had to work with their vendors to design a “print view” of the medical record to rectify this problem—a classic example of designing a system without the end in mind. As a result, many vendors had to retrofit a printing solution to meet the demands of the HIM department and ROI. This “upgrade” had a poor user interface and, more concerning, it provided a print view that significantly changed the medical record’s format from what could be viewed electronically. From a legal medical record perspective, several red flags were raised, and some plaintiff attorneys requested access to the actual physician view instead of the printed view. Other electronic hybrid challenges involved scanning the electronically printed record when interfaces from the niche systems to the EHR could not be developed. After having implemented a fully functional document management information system in 2002, I pushed to have all documents in one repository to simplify ROI. When implementing and designing an EHR, it’s important to make sure that the necessary information is in the designated legal record. Many systems employ links to scanned images in the document imaging system. However, most systems do not enable the printing or copying of these documents unless it has been specifically configured. This is a critical item, as the absence of document integration and the ability to either print or copy the selected components can impede productivity and lead to ROI integrity issues if the ROI coordinator fails to copy all requested records. In fact, HIM directors could face the possibility of being charged with being in contempt of court if their ROI vendor or ROI staff fails to pull the scanned images or requested documents in another location. To help avoid such circumstances, create a map for ROI staff that clearly delineates what is available on what date in which location. Another challenge for integrated delivery systems is the fact that organizations are buying physician practices at a fever pitch, resulting in custodial and ROI problems. In these situations, it’s important to find out where historical paper records are stored, identify whether there are legacy systems that contain portions of the legal record, and determine whether the EHR implementation road map addresses the best approach to consolidating record inventories. If retention guidelines have not been met, the goal is to consolidate paper storage to eliminate redundancies in storage and staff, obtain better pricing from the ROI vendor and, if the record management practice has been poorly maintained, invest in a targeted reinventory. Being on the bleeding edge of HIT does have its advantages. As vendors, professional and trade associations, and HIM professionals look to address ROI challenges, many technology-based solutions have been developed. Patient, payer, and physician portals can be utilized to reduce some of the conventional ROI burden. Pulling rather than pushing out records can eliminate or reduce the amount of HIM resources dedicated to ROI. It also can reduce turnaround times, boosting patient satisfaction and making timely information available at the point of care. In my last position, the EHR vendor did not have a fully functional payer portal despite it being included in the requirements document. However, my organization partnered with the vendor to design this application to replace functionality in the legacy system. Such a system can significantly reduce ROI requests by providing payer staff with access to legally approved components of the record. This access should be reserved for major payers associated with the specific encounter as either the primary or secondary payer. Physicians (and their proxies who have an established relationship with the patient but who may not be members of the medical staff) also gain access to ROI data through a portal. Terms of conditions and use are typically required prior to establishing access. An HIE can eliminate requests from providers at other hospitals who need immediate information in order to treat a patient. When consumer trust associated with HIEs increases, additional information will be able to be exchanged. Managing enrollment in an HIE can vary according to the model: vendor sponsored or a regional, national, or state health exchange program. Patient identification and data integrity are major challenges along with establishing a consent model for providers, vendors, and consumers. Patient portals and PHRs are helping consumers take responsibility for their healthcare. Portals offer patients a window to view their encounter data, diagnostic testing results, medication profile, allergy and adverse reaction information, and problem lists. Each healthcare system defines what and when information will populate the portal. Additional features and functionality enable consumers to perform online bill payments, schedule appointments, and communicate with their providers. Tough decisions regarding proxy access associated with minors and their reproductive rights according to state law and incapacitated adults must be made. Additionally, enabling enrollment in a patient portal needs to be carefully examined to determine its impact on workflow. Terms and conditions need to be carefully designed as well. The federal government is touting expansion of its “Blue Button,” a Web-based feature through which patients may download their health information into a PHR and share it with healthcare providers, caregivers, and others they trust. In organizations sporting any type of patient portal, HIM should be placed front and center when it comes to managing access changes and performing gatekeeper functions. Following widespread EHR deployment, there is typically an increase in the number of patient requests to amend their medical record. The majority of these requests are justified—patient reviews of medical records identify errors and inconsistencies that do in fact require physician intervention to correct. It is essential that sufficient resources be available to manage these requests in a timely manner. As the industry moves into a more fully optimized electronic environment, it becomes more feasible for HIT solutions to reduce the need for conventional ROI. However, these systems do not manage themselves. New roles and responsibilities are evolving, opening several opportunities for HIM professionals to flourish. Of immediate need are positions involving patient portal functions, including consumer enrollment, information management, and maintenance. Depending on the level of expertise of an organization’s ROI specialists and the size and scope of the technology deployment, these responsibilities can either be doled out to in-house candidates or spread across the enterprise and combined with other special functions associated with health information exchange. Ideally, consistent policies and practices can be developed and designed to facilitate compliance and reduce confusion among the workforce. There should be a dedicated role to advance consumer engagement related to how it fits into an organization’s accountable care strategy. This is an exciting time to change the conversation regarding how best to serve consumers in their quest to obtain their health information while removing needless barriers and bureaucracy. After all, it is their information, and healthcare professionals are merely serving in a stewardship and governance capacity. — Cassi Birnbaum, MS, RHIA, CPHQ, is vice president of HIM for Peak Health Solutions.